Perhaps of greatest interest today among Faithists is how are we, as a social order, going to transition into the Fraternity social order? So we will look at what is expected to occur in some degree as we move toward the time of Fraternity. Highlighting some historical transitions should help our understanding of what will transpire. There are five major steps of social order and its governance. From first to last they are: Monarchy, Pluracracy, Republic, Fraternity, and finally, Jehovih's Kingdom On Earth. Nevertheless, there were/are/will be transitions between these forms of governance. This word is coined to mean plural or split governance. A good example of the Pluracracy is the European Middle Ages in which King and Church separately ruled over the denizens of a realm. One significant feature, a hallmark, is when one leader holds one policy while the other ruler holds a differing policy; and since neither institution can do without the other, they must work out their differences somehow. Such a balance of power, though, is not our interest here except where it leads to a transition to the next higher (or in some cases lower) governance condition. Rather, we can understand that for the people in such a social order, a broader range of choice is thus given them, compared to having just one voice of authority (as in a monarch) that they are forced to adhere to. For example, at times in various Christian countries, fugitives from the law could take refuge and sanctuary in a church, especially when the case against them appeared to be unjust. The transition from Monarchy to Pluracracy is, as a general rule, very messy and filled with warring factions. But once there, the forward step in Pluracracy is to a sort of federated system, or to a lesser informal accord or understanding (entente) with some sort of pluralism. That accord (easy or strained) in any event can ultimate in the Republic step, since the practice of Pluracracy by the people gives them some amount of choice in the matter as to which master they will choose to obey. Eventually they choose themselves, in a manner of speaking, since they learn of their collective power and can become another force within the Pluracracy; and with this choosing, they choose in due course those who will represent them in the corridors of power, till they rise to gain sufficient power to rule over other competing power groups of the Pluracracy, at which time they set up a constitution for the people to share power, i.e., have a voice in their own governance (whence the meaning of Republic -- to REorganize power to the PUBLIC). Which is a much more humane and potentially peaceful way to change government than to overthrow an existing one. Now, historically, the transitions from Monarchy to Pluracracy have not been easy but fraught with jealousy, fitful vengeance, and series of wars. This is due to the tendency of those in power to strive to keep their position of power; thus a Monarchy will not readily give up power, but only when it is weakened and must concede some power does it do so. Those to whom some power (in the form of authority) is ceded often grow in strength because the populace, having lost some faith in the weakened Monarch, is, if not willing, at least not overly resistive to support the new power broker(s). This turn of public support results in the Monarch trying to stop the drain on his power. However, when a Monarchy fails, the state might not necessarily go forward, but it can fall backward into anarchy (a state of no-rulership), in which case the situation usually degenerates into a free-for-all of competing interests who seek to fill the vacuum of power. And the resulting leader almost always becomes a monarch, but more tyrannical than his predecessor so as to stop the state, or what is left of it insofar as institutions and systems go, from further hemorrhaging. On the other hand, if the transfer of power/movement is toward one or more groups of a previously growing Pluracracy, then one or more may actually seize the throne, but usually has less absolute power than the predecessor, and finds that other loser power factions must be mollified to some extent. Usually this means growth toward a fait accompli, or de facto, or ad hoc arrangement of a moderate but often distrusted entente. This reconciliation often occurs because the winning faction is looking to secure the state from further erosion and desires to place its resources into that end; and since their common enemy (the former monarch) is defeated, the victorious faction typically reaches out with a gesture of peace to the other factions who, themselves, are probably battle-worn and weary of war sufficiently to negotiate a deal. After the initial agreement, usually all the most powerful groups stay with the accord, at least until they feel restored sufficiently to challenge or ignore some or all of the agreement. If the situation evolves into a sort of balance of power, the door for greater cooperation generally opens a bit. This often comes about because each power group desires itself to be at least on par with its peer groups, and with peace comes a bonus of wealth (otherwise spent on military). This, in practical terms, means trading and the sharing of technologies and culture to some extent. This, in turn, brings the different populaces into an increasingly common ground (shared experiences) with each other populace's or group's ways. Thus is built the Pluracracy. If the Pluracracy starts to break down, it will either slip back toward the Monarchy social order or it will move forward toward the Republic social order. A difference arises in the latter case because the people are not moving toward any particular faction, but more toward a saner common way to live that is more or less peaceful within the social order. This is because the people have soured on all of the major factions of the Pluracracy. Instead, the people move toward picking their own leader and having that leader work it out with other nearby people-chosen leaders. Now, the transition from Pluracracy to Republic is normally preceded by some example or practice of the major Pluracratic players. And this example will have a system and order closer to a Republic form of governance as contrasted with the uncertainty of a full-blown Pluracratic order. Which means these factions tend toward the Republican form, if only so that the factions themselves can focus on their other needs besides security. The many hundreds of small realms within the so-called Holy Roman Empire of the European Middle Ages, loosely federating together under an elected-by-them Emperor with nominal powers, is an instance of this type of progressive model. Another example was the loosely-united pre-constitutional organization(s) of the colonies of America. In the latter case, the Pluracracy factions were initially chiefly each colony and Great Britain, but after the war (War of Independence, i.e., Revolutionary War), the factions were the 13 former colonies (states) themselves. Which is to say, the war caused them to unite, and the war debts they incurred kept them under one destiny --- of course, there were also underlying spiritual currents that kept them together including the shared experience of British rule, treatment and war. An interesting observation, for our purposes here, is that the transitions between the social orders were accompanied by war, usually wars of conquest, but the aggressors could settle for territorial expansion or increased influence. Now, Oahspe speaks of three phases: Monarchy, Republic and Fraternity. This latter phase is often confounded and conflated in Oahspe readers' minds as being the same as Jehovih's Kingdom On Earth. But it most definitely is not. Jehovih's Kingdom On Earth is the final phase of progression in man's social order. We have elsewhere written extensively about this, so it will not be reiterated here except to say that the transition between Monarchy and Republic social order, namely the Pluracracy, is significant enough to stand on its own as a Social Order, although its governance technically falls under Monarchy (typically ruled by a king or emperor). This then gives us five major social orders of man in his governance progression. The transitions between anarchy and Monarchy are often brutal, destructive affairs. Transitions between Monarchy and Pluracracy are, as mentioned, generally secured after a series of bloody wars of exhaustion and attrition. 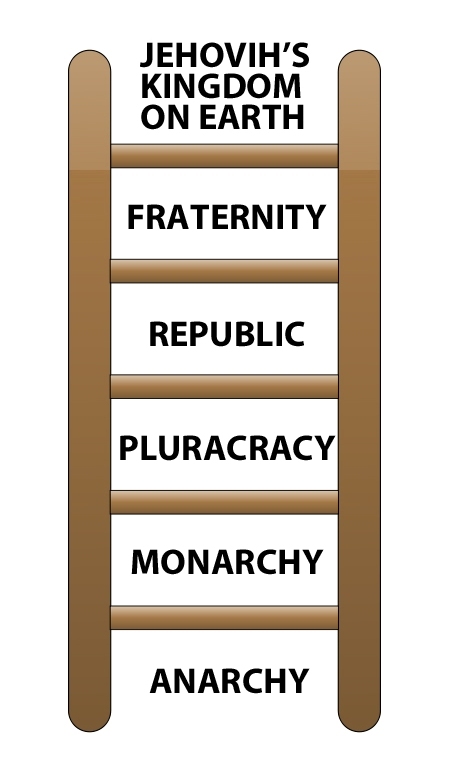 The transition between Pluracracy and Republic social order generally involve revolution and less warfare than in the Monarchy to Pluracracy stage. This is in part because each side in a Pluracracy is careful not to expend too much on any one enemy; which is to say, because the Pluracracy structure is going to be replaced, each side wishes to remain strong for the coming power struggle after the nominal Monarchy is overthrown; and as to the Monarchy itself, it is fighting on at least two fronts, its own people on one front, and the members of the Pluracracy on the other front. The transition from Republic to Fraternity is where things get really interesting. Let us see why. Amongst the world's people, in a Pluracracy, generally all major power factions demonstrate their faith in coercion through intimidation, and failing that, in weapons of war; yet, they are more likely to attempt a negotiated settlement rather than fight, lest they in their resulting weakened or distracted state, get attacked themselves from elsewhere. In the Republic social order, however, there is less fear of actual physical fighting (warfare) between factions. This is due to several factors, one of which is that the Republic social order generally forbids inter-factional violence. Another factor, somewhat related, is the reality and tolerance of (if not the promotion of) pluralism and multiculturalism. For which reasons -- being chiefly the trend toward less war, and the characteristics of the Republic social order -- the transition between Republic social order and the Fraternity social order will not involve warfare per se; this is to say, there will not be a violent revolution of any effect. For, stakeholders in the Republic social order will not readily cede power, and indeed by and large, will bend their power toward their own survival and the survival of the Republic. Yet, neither will they stop setting up as many roadblocks to progress toward Fraternity as they are able to get away with without suffering penalty, i.e., going to jail, being heavily fined, losing one's public face (image), and so forth. In a very real sense, there are many, many more power factions in a Republic social order than there are in a Pluracracy. This is normal since the Republic social order is a step closer toward Fraternity, and so, plenty of branches that will later give forth fraternity buds, can be expected to arise from within the Republic social order. Moreover, another interesting fact about Republic social orders is that, once attained, the people rarely are content to drop back into a Pluracracy; and if it is imposed upon them, will struggle till they regain the prize (that of having the populace in charge of their own destiny, albeit through their self-chosen representatives). At least for the above reasons, significant stakeholders in a Republic, such as those with high wealth, positions of power, privilege, prestige, etc., will not readily give in to the populace's "urge" to move toward Fraternity social order. The facelessness of the Republic social order (that is, its pluralism, multiculturalism, etc.) with its multitude of factions act as a blind behind which these stakeholders will hide themselves as they struggle to maintain their grip on the Republic social order. From behind these barricades they can be expected to launch attacks (psychological, legal, covert, gray-area legal, even illegal activities) aimed at any movement toward Fraternity that they deem they can affect (to their own benefit, of course, even though some of these hurlers will pretend that it is for the social weal). Bear in mind, we are generally speaking of survivors here with massive talent, albeit applied for self-purposes. By survivors, it is meant that because the Republic social order tends to be a meritocracy (at least for the aggressive members of society), those who make it to the pinnacles of power, influence, wealth, etc., got there essentially through successfully battling (usually without weapons of physical warfare) their way to become the king of beasts in their particular arena. For which reason, these are not people of slow hands and dull minds (corporeally speaking, that is; thus they will be worldly wise, but too often their Es wisdom will be lacking). The point of this is that these survivalists are very fluent in the ways and means of the Republic social order, and so, all too often will not hesitate to apply these talents for self-purposes when they can. Nevertheless, Jehovih will raise His hand above their heads and they will not be able to fathom His plans, nor obstruct them to any great effect. In other words, they ultimately will not be able to impede the progress toward the Fraternity social order. Said in other words, they might believe they are, for example, blocking fraternal housing with their laws, but in reality what they are doing is crystallizing people to all the more move in the direction of Fraternity and away from the Republic social order. Which is to say, Jehovih will use the survivalists' evil to inspire people to give up on the Republic social order and to move toward a better social order (which we know will be Fraternity). While in the years to come, especially after the dip in light ceases in 2017-18, there will not be any war or violent revolution in the transition to Fraternity social order, yet neither will it be smooth sailing. For always in transitions there are uncertainties and possibilities for extremes. We see this elsewhere in Jehovih's creation. Take in, for example, the transition zone between woodland and prairie. Here we see the greatest variety of species and ecosystems, compared to that which exist within the heart of either prairie or woodland. Because the line between the two zones is fluid, not only are species from both extremes found in the median locale, but opportunity also arises for new species or specialized species to gain a foothold here and there. Then there is Jehovih's heaven. Consider that people are most susceptible to change when they have reached an extreme, that is, when they are at the edge of their old reality, and the old explanations no longer fit the reality before them. Such then, is that which stands before man as he transitions between the Republic social order and the Fraternity social order. That which was not, will be; and that which was, will no longer hold sufficiently for the possibilities unfurling before man. For some, it will seem a time of chaos; for others, a time of exciting possibilities. And even as the landscape changes, Jehovih's workers will march onward toward Fraternity. The transitions from Monarchy to Pluracracy to Republic to Fraternity to His Kingdom On Earth stand before us as testimony of Great Jehovih's wisdom. May we all be alert to ever gain wisdom from Jehovih's creation, and learn to apply that wisdom well...for His sake and glory, and for the glory of His household through His kingdom that it may come on earth as it is in His heavens.